"Spanish- vs. Italian-Mediterranean Revival Architecture"
The subtle distinctions of Spanish and Italian influences can result in significant differences in the design of Mediterranean architecture. This overview explores the key principles to consider. 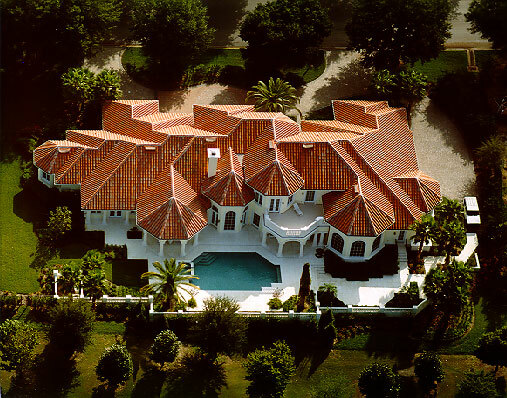 Tom Price Architect in Orlando, Fla., designed this residence for a European entrepreneur with very strict specifications: Italian Renaissance design with a floor plan of interlocking octagons. The aerial view shows the solution: octagonal rooms to the rear and rectangular rooms to the front. The owner also wanted a strong entry, so the entry porch was designed using a generous cast-stone application with a deep, stilted, elliptica entablature arch with a pronounced keystone that cannot be missed from the street. Mediterranean architecture. It's become a catchall phrase like Victorian or Colonial. All three are based on long-lived historic styles that underwent many permutations but are now painted with a broad brush that reduces them to the architectural equivalent of a sound-bite. Victorian is synonymous with a plague of gingerbread visited upon any available surface. Colonial infers Ye Olde-Fashioned Homesteade with rough-sawn everything. And Mediterranean invokes images of Taco Bell replete with cement stucco walls and faux-tile roofs. Yes, there are many ill-conceived, remotely historic renditions of these styles dotting today's landscape, but there are also outstanding contemporary interpretations of Colonial, Victorian and Mediterranean homes as well. Part of creating a successful Mediterranean home is to study and understand the history of the style and the various regions and countries from where it draws its influences. The use of architectural elements and designs indigenous to the countries surrounding the Mediterranean Sea as a fundamental trend began to take hold in the late-19th century and reached its apogee at the San Diego exhibition in 1915. There were several forces at workmost notably the Colonial Revival, which touted Classicism, and the American Arts & Crafts movement, which gave the world the Mission Style that was derived from ancient Spanish Missions in the American Southwest. The two dominant influences of Mediterranean architecture are those of Spain and Italy. To many of us, the design elements of these countries may be indistinguishable, but to the practiced eye, there are subtleties critical to each. Sean Lackey of Tom Price Architect, Orlando, Fla., notes the subtle variations in Mediterranean architecture: "Italian Renaissance is often referred to as being more feminine than Spanish Mediterranean. 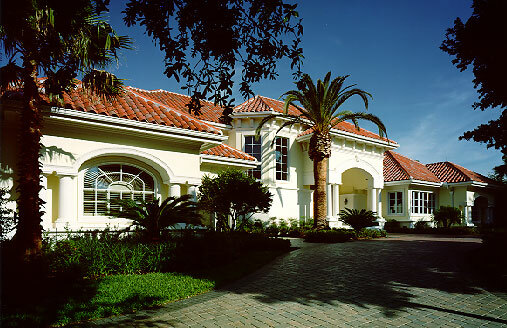 Structures tend to be more symmetrical and evoke European influences. There's a use of Classical order columns instead of Tuscan. There's more delicate detail and ornamentation on the exterior trim such as balustrades, windows, and doors. It's also common to see brackets supporting the overhang. Occasionally you'll also see brick facades. Spanish Mediterranean is less ornamental. It's crisper and more masculine. This style, also known as the Mizner style, was very popular in the 1920s when less ornamentation was in vogue. There's a lower pitch to the roofs and a heavier massing than Italian Renaissance. The Italian Renaissance has a more deliberately shaped massing, often into symmetrical expressions. The Spanish Mediterranean's massing is likely to be more haphazard and freeform." ...As with all historic styles, the creation of accurate reproductions and additions hinges on a keen observation of past work. In a way, Mediterranean Revival begs to be simplified, as its basic construction lends itself to mass production even more than other periods. Although the quest for accuracy is always an uphill battle against compromise, if we can only focus our client's attention on the importance of proportion and detail, we can make them an ally and not an adversary.